Thyme has a hearty, spicy flavor and an intense odor. The leaves are used fresh and dried. It goes very well with meat and fish dishes, soups, sauces and salads. Many vegetable dishes are often flavored with thyme. 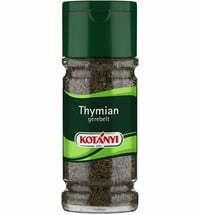 Thyme is also an important part of the French spice mixture "Herbes de Provence" . Thyme originated in the Mediterranean, but today is cultivated throughout Europe. It is also a popular garden herb. The more intense the sunlight, the stronger the flavor of the thyme.